Shamelessness has been taken to a new height - or, more likely, has plumbed a new depth - by someone out there on the right who long ago lost much of his self-awareness. Yes, clearly not fully occupied by his Free School, the loathsome Toby Young has decided to leverage the memory of Nicholas Winton, who saved 669 children from the Nazis, in order to score More And Bigger Publicity Opportunities For Himself Personally Now. You think I jest? Tobes is, it seems, deadly serious: he specifically pitches Winton’s name as the reason for his campaign, which, put simply, is this: there are literally thousands of unaccompanied children in European refugee camps, like those in Italy. Many have travelled alone; others have lost relatives during their journey to the North African coast; more have lost relatives during the crossing of the Mediterranean. However, and here we encounter a significantly sized however, organisations like Save The Children are already on the case, and have been for some time. The idea that Britons should be allowed to foster up to 1,500 of these unfortunate souls is theirs. That has not stopped Tobes from leaping aboard this particular bandwagon. “In memory of Sir Nicholas Winton, the British Schindler who saved the lives of 669 children in 1939, allow British people to foster the unaccompanied children currently languishing in European refugee camps” announces his petition on change.org. And, as Jon Stewart might have said, two things here. One, Winton disliked the Schindler comparison - the industrialist, after all, made money out of the Jewish workers he saved. And two, Winton shunned publicity for decades after the event. Indeed, Winton was not in it for the adulation, which, one suspects, may not be the case with Tobes. And what is also clear is that, while there are so many unaccompanied minors - not always young children, but also teenagers - in those camps in Italy, there is no comparison with the Czechoslovakia of 1939, no imminent threat to transport them all away to death camps at the hands of a brutal dictatorship. If Tobes really wanted to further the prospects of those 1,500 that Save The Children have identified, he would be far better advised to use his contacts in the Tory Party to lobby the Government that he supports behind the scenes. There may not be the opportunities for self-publicity there, but it would be far more effective. He could take his case, for instance, to my MP Edward Timpson - don’t worry Tobes, he’s a Tory - who is Minister of State for Children and Families. He grew up among fostered children. That Tobes has decided instead to launch a high-profile petition, accompanied by a letter to Young Dave and a classically liberal trowelling-on of Winton’s memory, suggests otherwise. 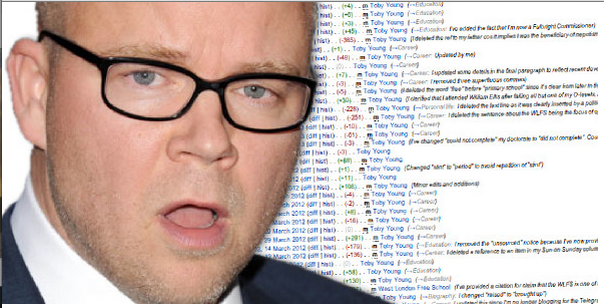 While Toby Young will protest that he isn’t in it for himself, his past form is there for all to see. He’s not so much Nicholas Winton as Dale Winton. Except I wouldn’t trust him to sweep my supermarket. He really is quite shameless. He embodies something this government seems very keen on - that of the enthusiastic amateur. Set up and run a school? Can't be that hard - teachers can manage it and they're all thick lefties! Aside from the anti-intellectualism and anti-professionalism elements, there's something more sinister - a basic suspicion of organisation or state involvement. Well, I'm sorry Toby, but love is not enough. You need people who are qualified, trained and funded, and who know what they're doing and won't just quit when they get bored or realise they're not getting the headlines they want.